Brandon Knight played college basketball for the University of Kentucky. He is a 6-foot-3, 177-pound point guard. He was the winner of the 2009 and 2010 Gatorade National Boys Basketball Player of the Year Award. He became just the third junior to receive the prestigious award following LeBron James and Greg Oden. On February 19, 2015, Knight was traded, along with Kendall Marshall, to the Phoenix Suns in a three-team trade also involving the Philadelphia 76ers. Two days later, Knight made his Suns debut, recording 13 points and 5 assists off the bench in a 112-107 loss to the Chicago Bulls. 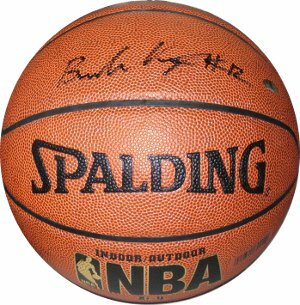 Brandon Knight has hand signed this Indoor/Outdoor NBA Basketball. Private signing 5/28/2011. SI Hologram and Certificate of Authenticity from Athlon Sports.